Although dressing exactly the same, just in different proportions has become a bit outdated, it’s all about picking a trend or a theme and making it your own whether you’re 5 or 85. Featuring on catwalks across AW17 and SS18, this isn’t just a passing fad. Dolce and Gabbana are well-known for their celebration of the modern family and hold this close to their ethos with campaigns and collections drawing on this image. Their recent AW17 show saw millennial’s to musicians and bloggers to royalty, walking the runway with their families in a celebration of love and diversity. Working closely with the ‘models’ throughout the creative process allowed the shows’ trends and styles to be depicted differently for each individual. 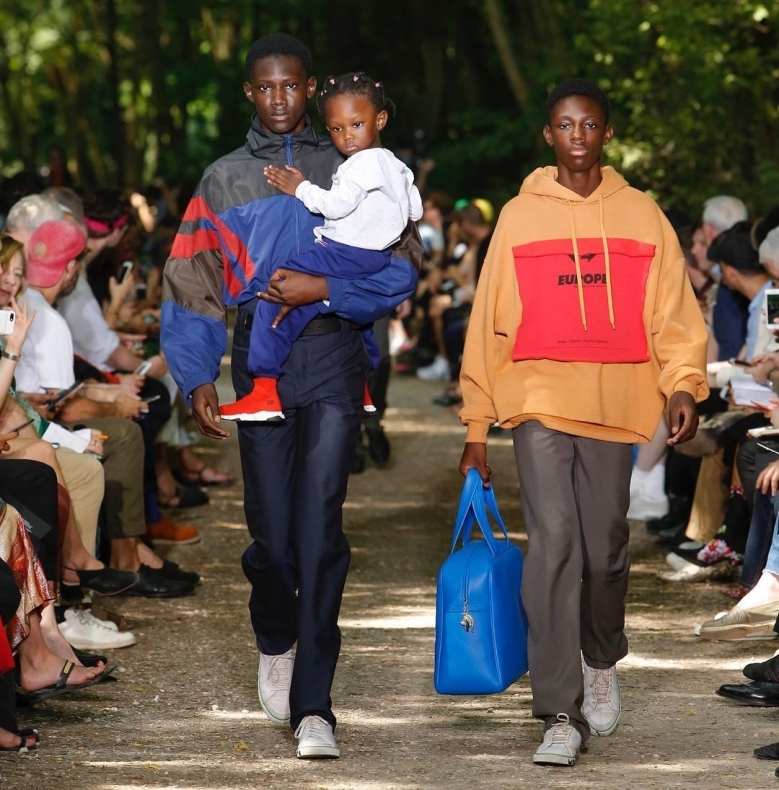 Balenciaga followed suit for their SS18 runway with looks inspired by Dads enjoying a day at the park with their children. The catwalk saw a diverse group of men in “dad-core” attire; including relaxed jeans, button down shirts, parkas and brogues, walking hand in hand with their very stylish kids. With an on-going internet obsession with trendy dads and co-ordinating families, the brand wanted to send a positive message of hope and new beginnings through the social world. Feeling inspired? We believe it’s time to clear out the wardrobes and create you’re very own capsule family wardrobe to make weekend outings a lot more fashionable. We might be bias but the best place to start is with your shoes, so we’ve chosen some killer catwalk moments and handpicked our best matched shoes to help you get the look. A huge trend for this season, metallic shoes will add a dressy finish to any outfit. 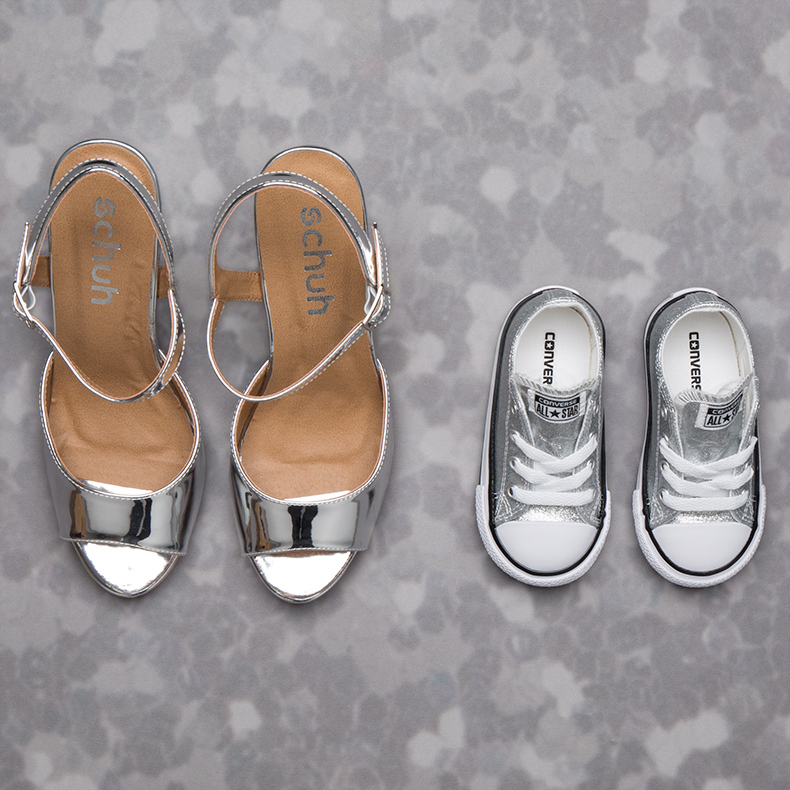 For a girly day out, stick to a similar colour palette for co-ordination points but keep the style of shoe age appropriate, like this metallic silver block heel for mum and glittery silver converse for daughter. 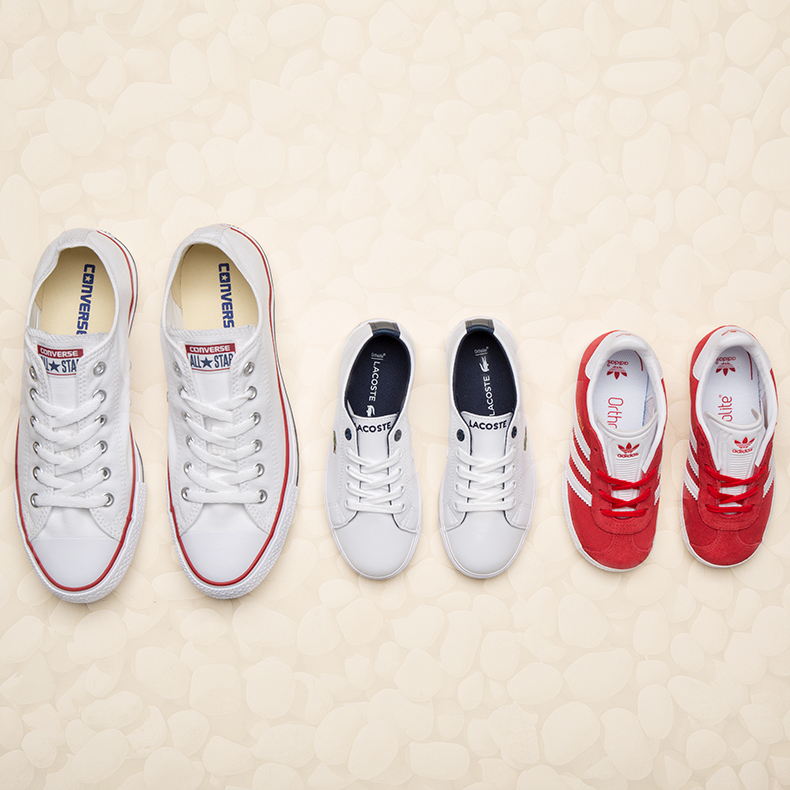 Family days out are the perfect chance for adventure, so make sure your shoes are ready for anything. 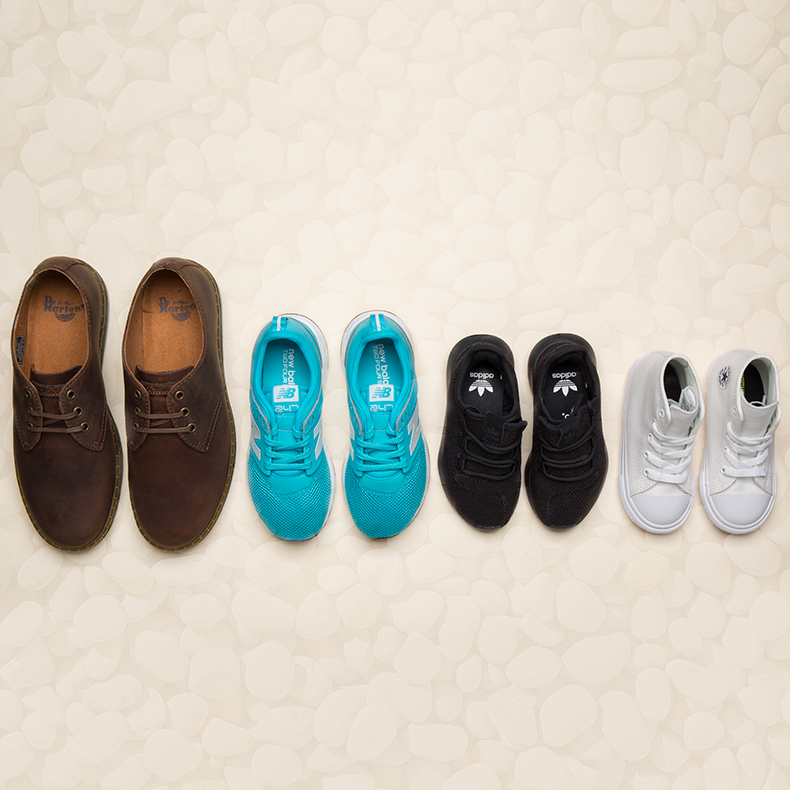 While dad can keep things dapper but casual in a pair of laid-back derby shoes, make sure the kids are comfy with an on-trend trainer in a contemporary profile for extra style points. Whether it’s a trip to the shops or a big game day, sport-luxe styling is an easy way to include the whole family. A crisp white tennis shoe is a go-to profile for the masses and will suit any age but veer away from a total shoe white-out by bringing a bright trainer into the mix like this red Gazelle. It’ll be a family affair at your next big event when you nail this multiple styling. Take queues from this famous family and go black and gold in some elegant profiles for all. Match a classic court heel with some slip-on loafers while tiny brogues and high-shine patent dolly shoes steal the show. So go on, try the trend for yourself and pick your very own family shoedrobe from our range of men’s, women’s and kids styles.